1987 – the year of Tiffany, Rick Astley, “Walk Like An Egyptian” – a group of degenerate, demonic teenagers from San Francisco conjured a primitive, minimalist, trance-like buzz from their basements. 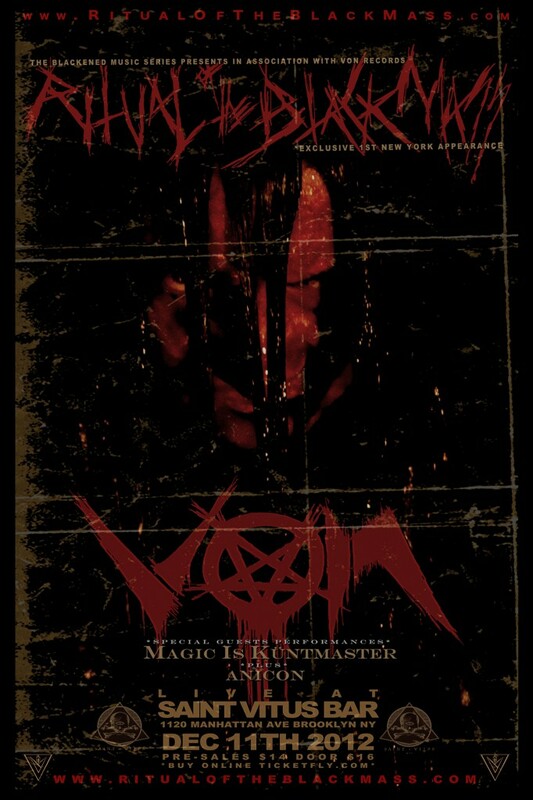 VON’s two recordings, Satanic Blood and Blood Angel, were passed around the world as bootlegs, inspiring the Second Wave Norwegian sound that spawned thousands of bands over the last 25 years. After breaking up twenty years ago VON is back with their first official album and their first ever East Coast ritual. Magic is Küntmaster Camilla Ha makes crowds uncomfortable. Her extreme, experimental, ritualistic performances are eerie and disturbing, full of anger, aggression and violence. More info here. Anicon Brooklyn’s best new Black Metal band plays their first ever show. Get their excellent EP mastered by Colin Marston (Krallice) here. The Ritual of The Black Mass comes to Saint Vitus on December 11, and there will be blood.